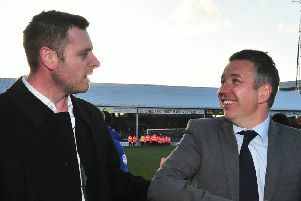 Darren Ferguson (right) and Gavin Strachan shake hands after signing their new Posh contracts. Photo: Joe Dent/theposh.com. Manager Darren Ferguson insists he has joined a much-improved Peterborough United compared to the one he left four years ago. Ferguson, who had been working on a short-term contract at the ABAX Stadium, today signed a three-year Posh deal. Assistant manager Gavin Strachan has also agreed to stay until 2022. Ferguson admits he is both delighted and excited to be given the chance to return Championship football to Posh. 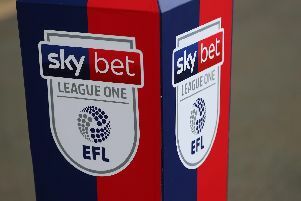 The 47 year-old has steered Posh into the second tier of English football on two previous occasions, but the club have been stuck in League One since the 2013-14 campaign. Ferguson also believes ending the uncertainty over his future could breathe life into this season’s promotion campaign. Posh have lost six and won just two of nine League One matches since Ferguson returned to the club at the end of January. “The target remains the same as it’s always been and that’s Championship football,” Ferguson said. “But the club is in a much better position to achieve that now than in recent past. “The training ground is far better, there are plans to develop the stadium and we have increased our Academy budget. They are all things I wanted in the past so I’m on board with all the plans for the club. “We all want the same thing and that’s important. It’s vital everyone from the chef to the highest paid player pulls in the same direction. I have a great relationship with the chairman and I have enjoyed speaking to the co-owners. It’s important for me to join a club with the potential to reach the Championship and to stay there. The chairman is demanding, but he is also very supportive. “First and foremost me and Gavin are delighted extend our stay here, but we are also very excited about the future. “We will try and build a fairly young squad, with the same energy, drive and ambition we have. “And let’s not forget we could still reach the Championship this season. Maybe we’ve been fortunate that other clubs’ results have kept us in touch with sixth place, but it’s a fact that our season is not dead and buried.